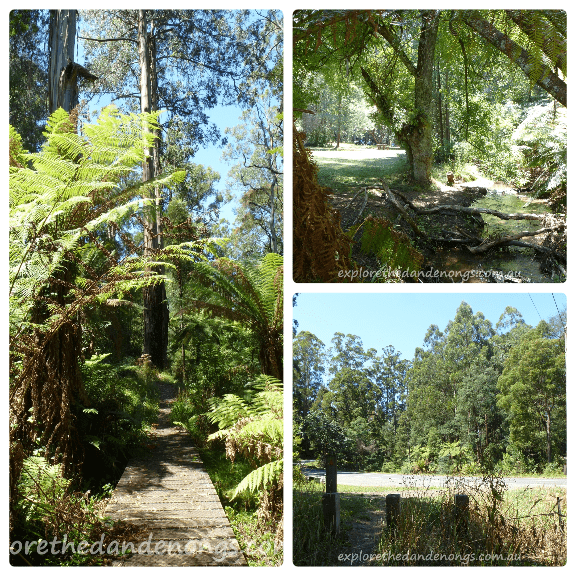 Dandenong Ranges Tourist Track – Sassafras to Emerald – 15 km one way. 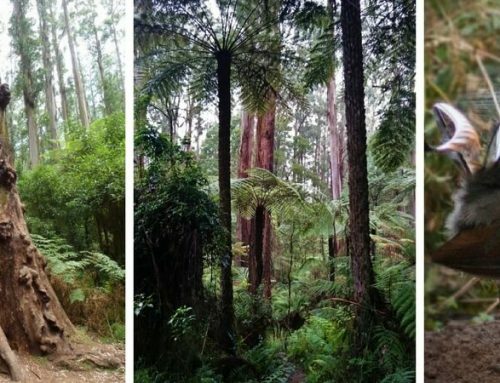 From Sassafras to Emerald, the Dandenong Ranges Tourist Track is a 5- 6 hour hike through the superb forest, crossing streams, boardwalks and roads along the way. Graded moderate to easy, the walking track can be tackled from either direction, done as a whole or divided into smaller sections. 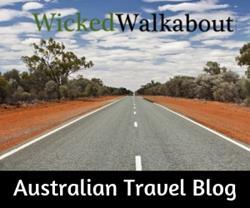 The walk is 15 km’s to Telopea Steps or 16.5 km’s to Emerald. Puffing Billy Steam Train could be boarded for a return trip option from Emerald or Emerald Park Lake. Public transport can also be used, buses run from Emerald to Belgrave. This walking track does not have the steepness of the 1000 Steps walk, but it is much more of a challenge distance wise! Feeling energetic? 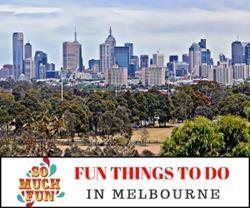 Needing a city escape and a BIG day out? Catch a train to Belgrave station then Puffing Billy Steam Train or a connecting bus to Emerald. Follow the map to the beginning of the walk at Telopea Road Steps. Walk the 15 km / 5 -6 hours to Sassafras, eat, drink, rest and revive. Catch the bus from Sassy to Upper Ferntree Gully train station and return to the city. Check timetables depending on the day of travel. Limited parking is available in Sassafras beside the Dance Hall (opposite Geppetto’s Toy Shop) This is the beginning of the Dandenong Ranges Tourist Track. Parking at Emerald – If walking from this direction, parking is available in Emerald. Telopea Road Steps has very limited parking. 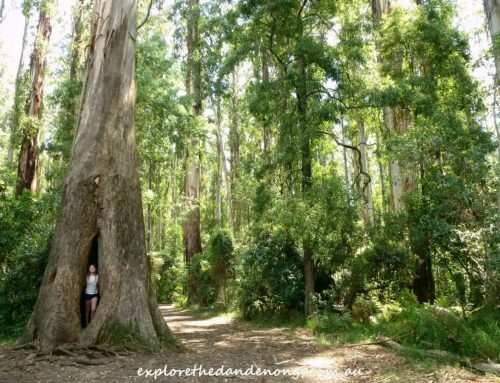 The Dandenong Ranges Tourist Track skirts around Monbulk and does not go through the actual town. Take some nibbles and a drink, stop along the way at numerous picnic grounds or walk into the villages en-route. Not suitable for baby prams. 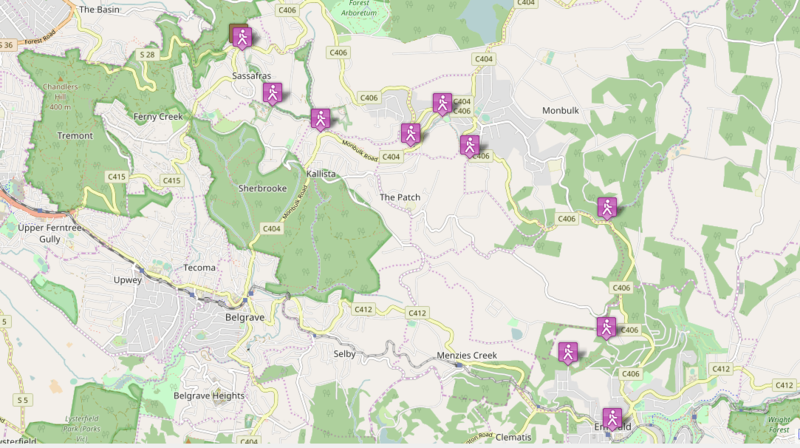 Toilets en-route available in Sassafras, Baynes Park & Emerald. Cross the road and follow the track until it emerges on a small side road called Boucher Lane. Turn right and walk to the end of Boucher Lane to join Perrins Creek Road. 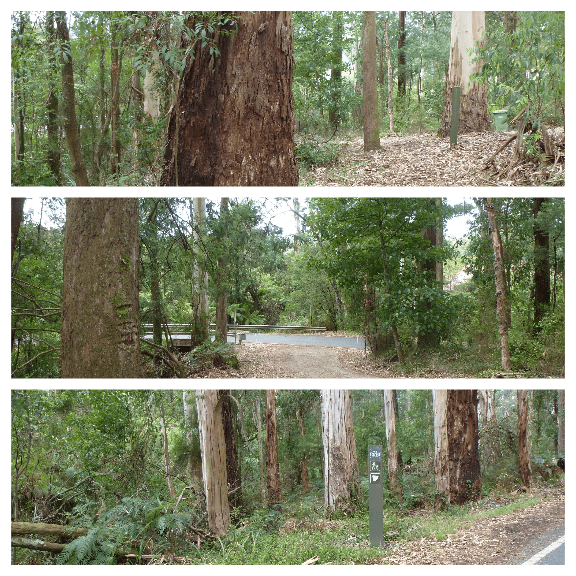 Turn right on Perrins Creek Road and walk a short way to the junction with Sassafras Creek Road. 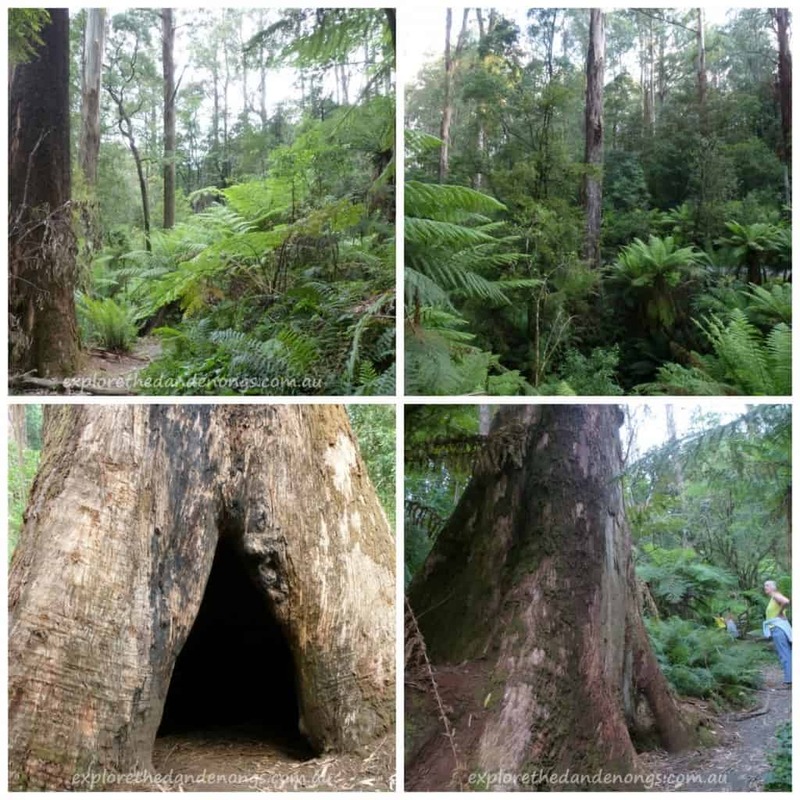 Either turn right into Sassafras Creek Road and then join the track again very soon on the left for a short walk to Beagley’s Bridge picnic ground or walk down Perrins Creek Road to Beagley’s Bridge picnic ground. From Beagley’s Bridge picnic ground, follow the orange markers and cross over Belgrave-Monbulk Road and continue on the track. The track passes by a few picnic grounds before crossing over the Belgrave-Monbulk Road again. On the other side of the road, the track drops down and goes along behind the Monbulk Swimming Pool and into Baynes Park Reserve. Continue on the track which goes above and around the playing field to then reach the road crossing or walk around the playing field on the track until coming to Baynes Park Road, crossover and continue following the orange markers (toilets are available near the playing field). The track continues to a junction with Moxham Road. Cross over the junction back onto the track and continue to the next road crossing. From this section until Butterfield Reserve the track might be quite overgrown, passable, but not easy going. Cross the road again and keep walking… There is another small road crossing before coming to David Hill Road where you again cross the road and follow to arrive at Butterfield Reserve. 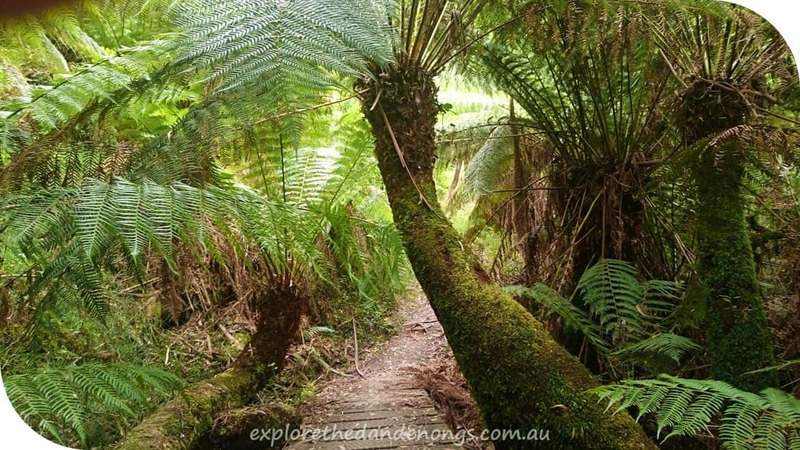 Cross the Emerald-Monbulk Road to the next section of the trail following Menzies Creek. One more road crossing (Kallista-Emerald Rd) and then straight on through the forest to A’vard picnic area. The track joins the unsealed A’Vard Road, passing by the little picnic area and then branches off through a gate on the right a little further down. 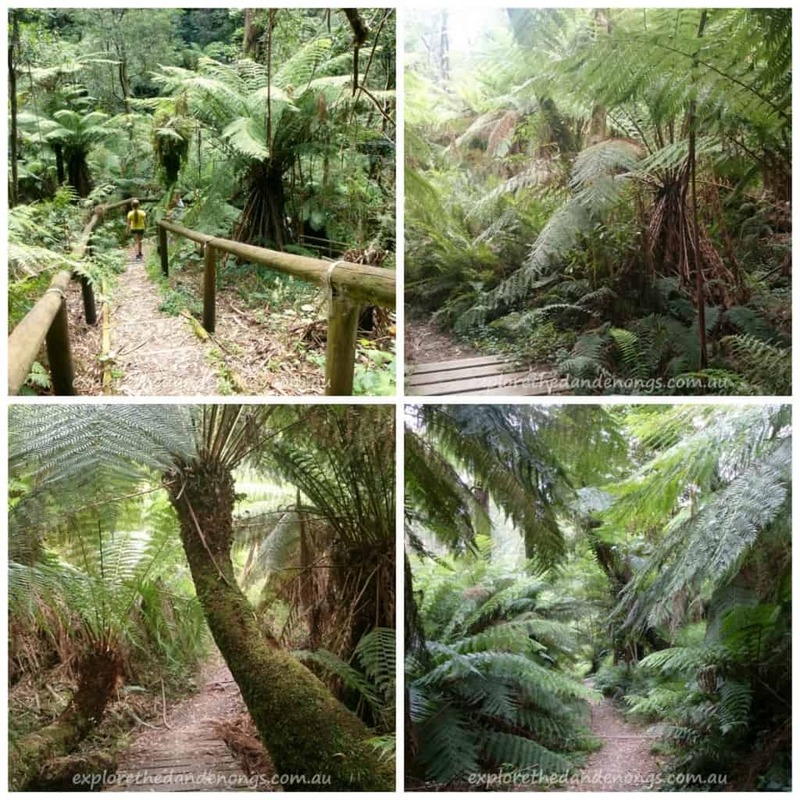 Stay on the trail, turning right at the only junction, and continue all the way to Telopea Steps. From the steps, it is a 1.9 km walk uphill and along both unsealed and sealed roads to Emerald. Emerald Park Lake is a further 1.5 kms for anyone wishing to extend the walk. 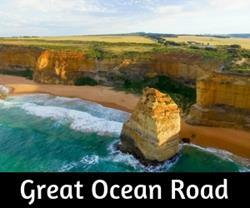 From Emerald, it is a 1.7 km walk downhill and along both unsealed and sealed roads to Telopea Steps. From Telopea Steps, follow the track all the way,( turning left at the first junction) until coming out at a gate on A’Vard Road. Turn left and walk up past the small picnic area to the top of the road where the track continues. Stay on the track, crossing over Kallista-Emerald Road until it then crosses Emerald-Monbulk Road and comes to Butterfield Reserve. From Butterfield Reserve to Moxham Road junction the track might be quite overgrown, passable, but not easy going. Follow the track leading out of Butterfield Reserve, crossing David Hill Road then Rankins road before coming to Monbulk – Emerald Road again. Crossover and re-join the track, look for the orange markers. Continue on, crossing the Moxham Road junction and re-joining the track again. Crossover Belgrave-Monbulk Road and through Beagley’s Bridge Picnic Area. 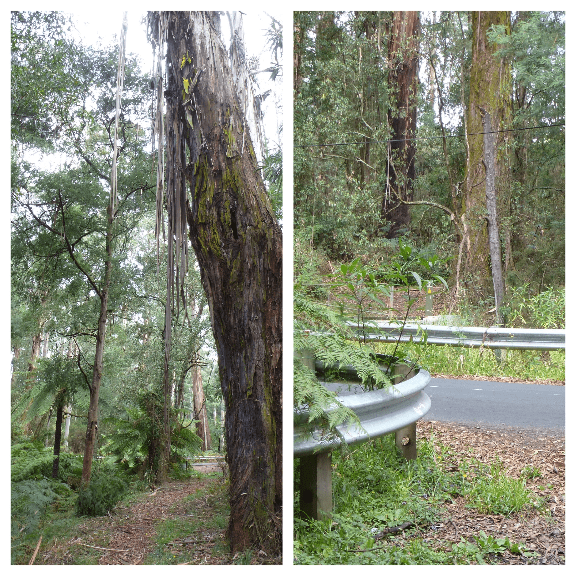 Continue up the track until meeting Sassafras Creek Road junction with Perrins Creek Road. Continue to ‘The Crescent’, cross over and follow the track again off to the right. Crossover The Crescent again, follow the track until the steps are on the left, heading up into Sassafras. Heading down steps from the car park, take the track to the right when reaching a t-junction. This is the only part of this section to include steps, the rest of the walk meanders through forest, over a footbridge and then crosses a road called ‘The Crescent‘ to begin again on the other side. Follow the trail on through the forest, with occasional glimpses of the road and properties. The track crosses ‘The Crescent’ again, at a point below the Alfred Nicholas Gardens. Crossing the road, the next section of the walk is a favourite. 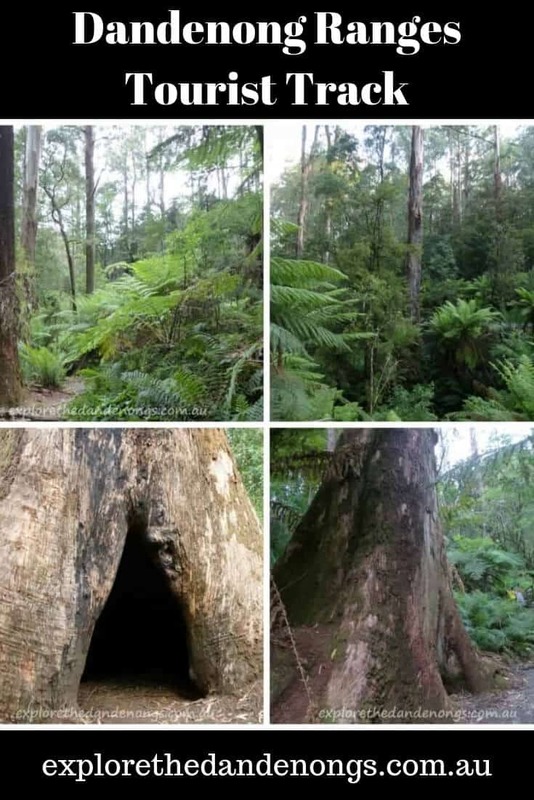 It passes between massive trees, with an elevated view over the cool temperate rainforest canopy below. The track then comes out on an unsealed road, Boucher Lane. Turn right at this point and walk a short distance to meet Perrins Creek Road. Turn right and walk a short distance to the junction with Sassafras Creek Road. 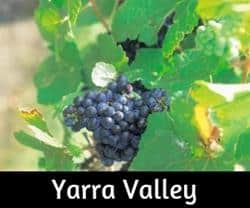 Either turn right into Sassafras Creek Road and then join the track again very soon on the left for a short walk to Beagleys Bridge picnic ground, or walk down Perrins Creek Road to Beagleys Bridge picnic ground. From Beagleys Bridge, follow the orange arrow markers, across Belgrave – Monbulk Road, the track continues towards Monbulk. 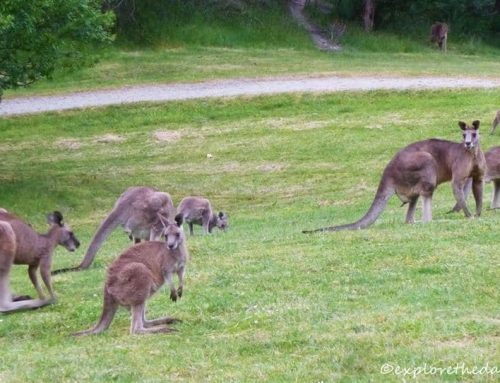 It follows quite closely to the Monbulk Road and passes through Kay’s, Olympic and Kensley’s picnic grounds. 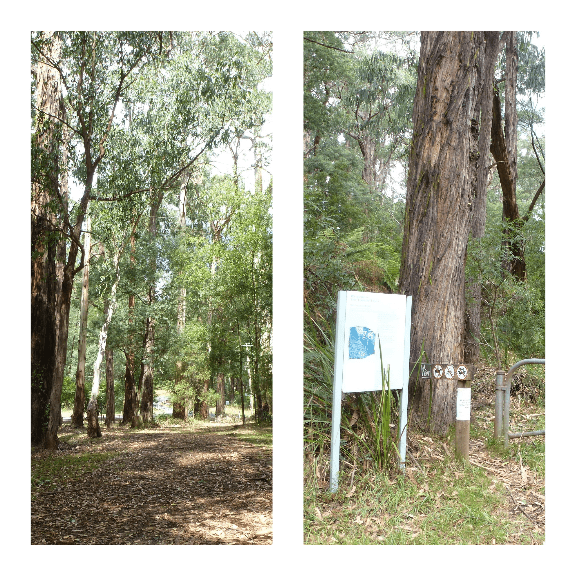 Stay on the narrow track past the picnic grounds until reaching the Belgrave – Monbulk road where the track crosses to the other side and continues along and behind the Monbulk swimming pool. The track continues around the small oval at Baynes Park until reaching the road where it crosses once again. The orange markers are well placed and easily seen. Toilets are available near the playground at Baynes Park as well as picnic tables and BBQ’s. Bottom right photo: Crossing the road towards Monbulk swimming pool & Baynes Park. After passing behind the Monbulk Swimming Pool and Baynes Park, the track crosses the road again (above image). Just keep on walking… following the little orange arrow. The path continues and is easy to follow. It comes out by a junction with Moxham Road (image below). Simply cross the junction and continue until you come out at another road crossing. From this point until Butterfield Reserve, the track can be quite overgrown though is still passable. Beware of blackberry prickles! Below images: Coming out of the forest again.. another road crossing. Orange markers are easy to see. There will be one more road to cross, David Hill Road, before arriving at Butterfield Reserve. Butterfield Reserve, a small picnic area with tables. 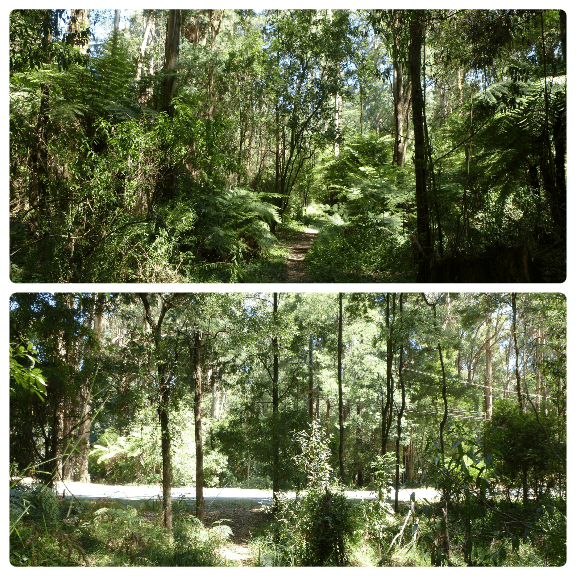 The trail again crosses a road (Monbulk/Emerald Road) and heads into the forest to continue on to A’vard picnic area. This next section follows the course of Menzies Creek. Named after Scottish prospector, John Menzies, the first man to strike gold at Emerald in 1859. One more road crossing on this section of the walking track (Kallista-Emerald Rd) and then straight on through the forest to A’vard picnic area. The track joins the unsealed A’Vard Road, passing by the little picnic area and then branches off through a gate on the right a little further down. Quite easy to see as you approach. Gate beside A’Vard Road where the track continues on to Emerald. 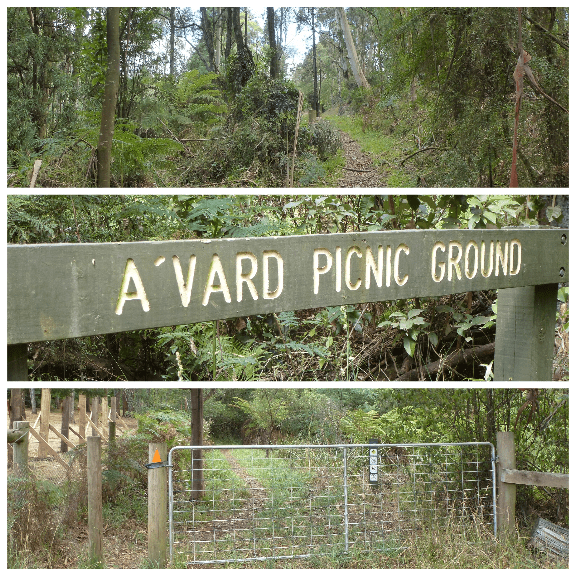 A’Vard picnic ground to Emerald – 1 hour approx. one way. Keep on going… not too far now. Another hour along the track to Emerald. Once the Telopea Road steps are reached (image below) it is a 1.7 km walk uphill and along both unsealed and sealed roads to Emerald. Emerald Park Lake is a further 1.5 kms for anyone wishing to extend the walk. 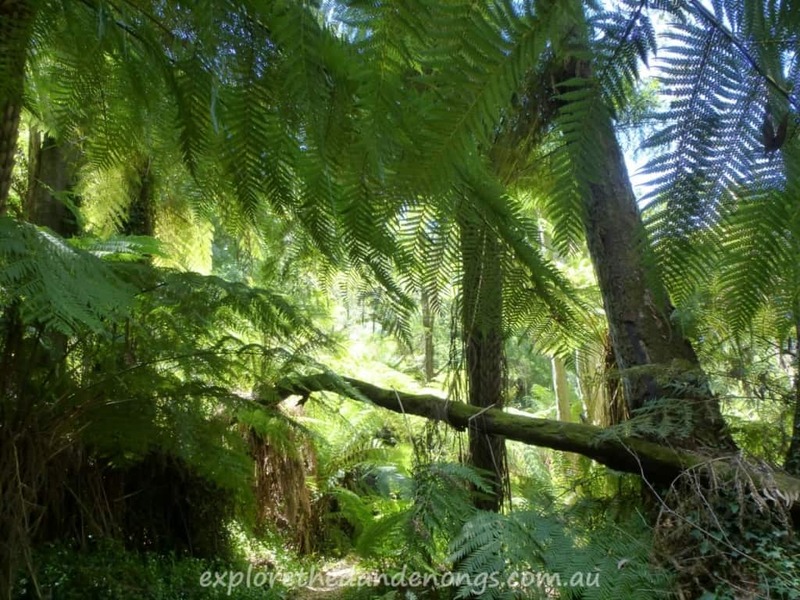 Stay overnight in Emerald or Sassafras and enjoy a few days in the Dandenong Ranges. Beautiful walk from Sassafras to Emerald except it’s one of the poorest signed walks I’ve ever done. A tiny orange triangle marker was the only indication we were on the right track. We noticed that a lot of the walkers were tourists or people who don’t have English as their first language. Time to move jnto the 21st century with signage in different languages on the trails. Thanks. 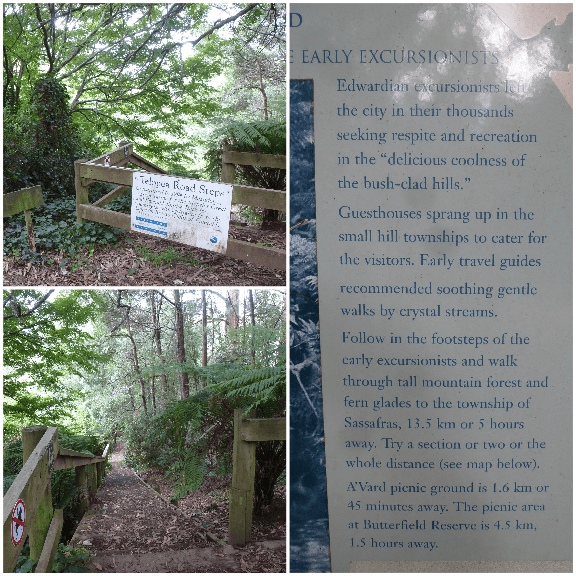 I do agree that the signage could be clearer on the Sassafras-emerald walk. I hope you enjoyed the track and the walk notes were helpful.